I’ve been dealing in vacant houses nationwide in recent weeks. Back taxes due for more than 1 year. Daily nuisance fees or code violations of $250 a day. One house had $18,000 in these fees. Bullets shot into the house, or through the windows. Pipes that froze over winter and busted. Water leaks that ruined floors, subflooring, and the like. Some have been torn down by the county because they were just too neglected. If your house is vacant and is taking too long to sell, the reality is that in so.me areas of the country, that is an open invitation to problems. I was working on a vacant house that I had bought and the pipes burst on me. It was a really expensive disaster. The house pictured here was vacant. Vandals decided to shoot at it and break the windows. 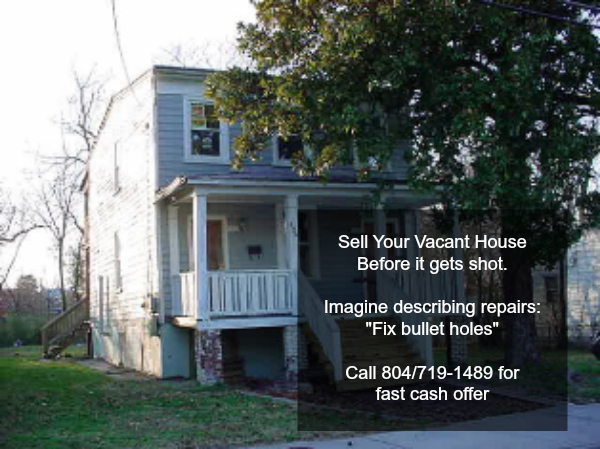 While we specialize in vacant houses in VA, we now have cash rich and hungry buyers in various areas of the country ready to help you sell your vacant house before it becomes too blighted. Maybe it’s too far gone. We might still be able to work a solution. Simply get our offer calling us at the number above, or fill out our form to get a fast cash offer for your house. within 24 hours or less. It starts by filling out this form, or contacting us.